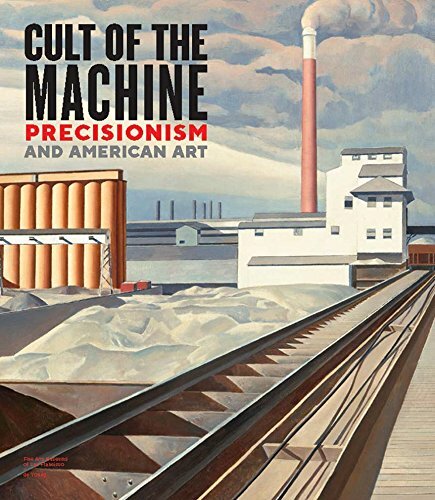 The Fine Arts Museums of San Francisco (FAMSF) is set to premiere Cult of the Machine: Precisionism and American Art, the first large-scale exhibition in over 20 years to survey this characteristically American style of early twentieth-century Modernism. Organized by FAMSF and on view at the de Young, the exhibition addresses the aesthetic and intellectual concerns that fueled the development of this artistic style during the 1920s and 1930s. More than 100 Precisionist masterworks by seminal artists such as Charles Sheeler, Georgia O’Keeffe, and Charles Demuth are displayed alongside prints by photographers such as Imogen Cunningham and Paul Strand; clips from films such as Charlie Chaplin’s Modern Times; and extraordinary decorative arts and industrial objects from the period—including a vintage Cord Phaeton automobile—to reflect the widespread embrace of a machine-age aesthetic by artists, designers, and the public alike. Cult of the Machineconsiders how the style reflects the economic and social changes wrought by industrialization and technological progress during the Machine Age in America. Visitors are encouraged to draw connections to our own technological moment, one in which optimism and dreams about what technological progress can achieve are tempered with anxiety or suspicion about its potential dangers and misuses. 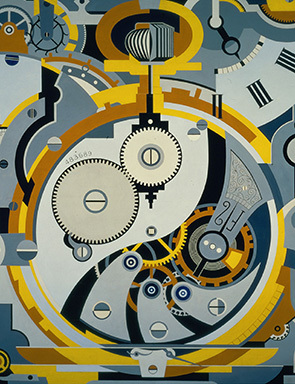 Gerald Murphy, Watch, 1925 (detail), oil on canvas, Dallas Museum of Art, Foundation for the Arts Collection, gift of the artists, 1963.75.FA, © Estate of Honoria Murphy DonnellyLicensed by VAGA, New York, NY. The majority of Precisionist works were created during the tumultuous period between the World Wars, decades when the country’s new technologies and indus­tries were met with multiple and contradictory responses in the arts, literature, and popular culture. As today, there was a general excitement in the United States about technology’s capac­ity to engender opportunity and improve the conditions of daily life, yet these attitudes coexisted with fears that it would supplant human labor and deaden the natural rhythms of life. Precisionist artists reflected such contradictions and complexities in their work, capturing a sense of the beauty and the coldness, the sublimity and the strangeness of the mechanistic societies in which they lived. 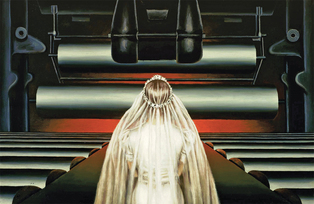 Precisionism emerged in America in the teens and flourished during the 1920s and 1930s. The style combined realist imagery with abstracted forms and married the influence of avant-garde European art styles such as Purism, Cubism, and Futurism with American subject matter. Artists as­sociated with the style typically produced highly structured, geometric compositions with smooth surfaces and lucid forms to create a streamlined, “machined” aesthetic, with themes ranging from the urban and industrial to the pastoral. Masterpieces of machine age Modernism are on loan from more than 50 institutions from across the United States, including the Amon Carter Museum of American Art, Brooklyn Museum of Art, Dallas Museum of Art, Harvard Art Museums, National Gallery of Art, Nelson-Atkins Museum of Art, Walker Art Center and many others. Cult of the Machine is curated by Emma Acker, associate curator of American Art for the Fine Arts Museums of San Francisco.